NASA’s latest mission to Mars took its next step on its long journey to the Red Planet. On Dec. 16, Lockheed Martin delivered NASA’s InSight spacecraft to Vandenberg Air Force Base, Calif. 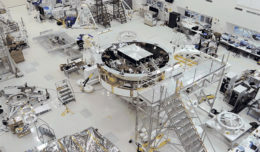 The lander will now undergo final processing in preparation for a March launch aboard a United Launch Alliance Atlas V 401 rocket. 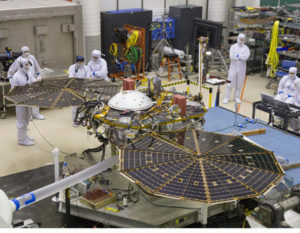 A Lockheed Martin team shipped NASA’s InSight Mars lander from Colorado where it was built to Vandenberg Air Force Base, Calif., where it will launch to Mars in March 2016. The InSight lander will study the deep interior of Mars and will address one of the most fundamental questions of planetary and solar system science: how did the planets form? The mission will help scientists understand the processes that shaped the rocky planets of the inner solar system more than four billion years ago. Lockheed Martin designed and built the spacecraft and is responsible for testing, launch processing and mission operations. InSight was previously scheduled to ship to California in early January, but delivery was moved three and a half weeks early to provide more time at the launch site for the integration of the seismometer instrument developed by the French Space Agency, CNES. Prior to delivery of NASA’s InSight Mars lander, the lander underwent a final solar array deployment test in a clean room at Lockheed Martin. 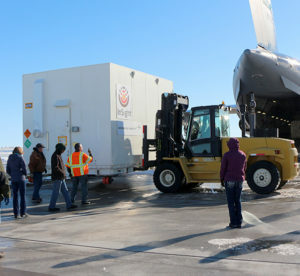 The 1,380-pound spacecraft, consisting of the lander, aeroshell and cruise stage, was shipped aboard a U.S. Air Force transport plane in an environmentally controlled container. 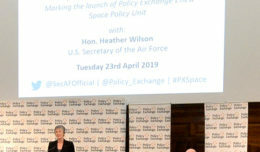 The plane, spacecraft and support personnel took off from Buckley Air Force Base in Aurora, Colorado and touched down at Vandenberg Air Force Base. While at Vandenberg at the Astrotech Space Operations facility, the spacecraft will undergo final processing including the installation and testing of the SEIS instrument, system-level checkout, propellant loading and a spin balance test. The InSight mission is led by the Jet Propulsion Laboratory’s Bruce Banerdt. The Centre National d’Etudes Spatiales, France’s space agency, and the German Aerospace Center are each contributing a science instrument to the two-year scientific mission. JPL, a division of the California Institute of Technology in Pasadena, manages InSight for NASA’s Science Mission Directorate in Washington. InSight is part of NASA’s Discovery Program, managed by the agency’s Marshall Space Flight Center in Huntsville, Ala.